For the body, I knit in the round for the required length, alternating blue and pink rows. At the top, I created holes by repeating *yo, k2tog*, then bound off in the next row. I then sewed up the bottom. For the pull cords, I made two 3-strand braids, each about four times the width of the cover. I looped the cords from opposite ends, weaving them between the yarn-over holes, and finally knotted together the ends of each cord. The basic Tunisian stitch is different from the usual crochet stitches in that it has two passes in each row — the forward pass where you move from right to left, and the reverse pass where you move from (you guessed it! 🙂 ) left to right. You don’t turn your work after a row. 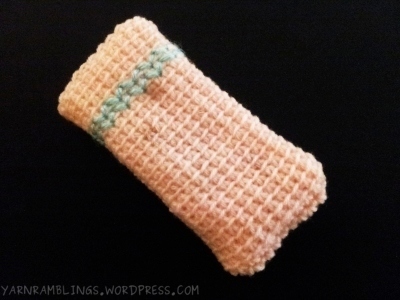 If that interests you, you might want to look at Mary’s excellent photo-tutorial that shows step-by-step instructions for a basic Tunisian stitch. I wanted the vertical bars from the Tunisian stitch to show up horizontally on the phone cover, which meant that my rows had to correspond to the length of my mom’s phone. 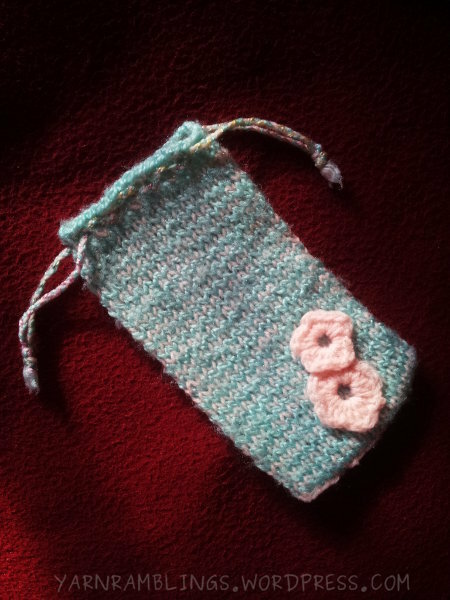 I measured the phone, cast on my foundation row, and within no time, I’d crocheted enough to wrap the phone in. I then sewed together the last row and the first row to make a cylinder, then sewed up one side to serve as the bottom of the cover. That’s it! Do you like how simple-yet-beautiful this stitch is? Try it out sometime!